Small coil (solenoid) used in some Data East, Sega, and late-model Stern Pinball games. Includes diode across top (front) of solder lugs. Coil sleeve not included. 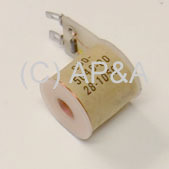 Use sleeve # 545-5500-00, available separately. NOTE: Not to be substituted for/with # 090-5046-01 or 090-5046-01-ND (not compatible).